The National Historic Lighthouse Preservation Act of 2000 (NHLPA), 16 USC 470, authorizes the disposal of historic lighthouses and stations. The Act amends the National Historic Preservation Act of 1966 and establishes a national lighthouse preservation program. NHLPA recognizes the cultural, recreational, and educational value associated with these historic resources by allowing lighthouse properties to be transferred at no cost to federal agencies, state and local governments, nonprofit corporations and community development organizations for park and recreation, cultural, historic and educational uses. The NHLPA provides for a federal panel to review applications for each lighthouse. The US Secretary of the Interior would then make the final selections. Applications will be judged on the merits of the preservation and use plan, and financial and management plans. Under the NHLPA, the new owners must agree to adhere to the Secretary of the Interior Standards for Rehabilitation and make the site available to the public. When it was announced by the United States Coast Guard that the Currituck Beach Lighthouse was going to be transferred under the NHLPA, the Outer Banks Conservationists began their bid for consideration. The Outer Banks Conservationists, a private, nonprofit group with more than 2000 members, was founded in 1980 for preservation and conservation purposes. They hold a 50-year lease with the state of North Carolina for the compound, and a 20-year lease on the lighthouse with the US Coast Guard. Over the past two decades, they have raised more than $1.5 million to restore, maintain, and operate the Currituck Beach Lighthouse. As such, they would seem to be in good standing to have the Currituck Beach Lighthouse conveyed to them under the NHLPA. Notwithstanding any other provision of law, the historic light station known as the Currituck Beach Lighthouse shall be conveyed, by quitclaim deed and without consideration, to Currituck County, North Carolina. The conveyance shall be completed as soon as practicable after the date of the enactment of this subtitle. 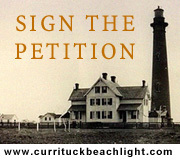 This amendment, if approved, would give the Currituck Beach Lighthouse to the Currituck County government, without the review process called for in the National Historic Lighthouse Preservation Act of 2000, an Act that Congressman Jones co-sponsored. Congressman Jones, and others, argues that nonprofit organizations, such as the Outer Banks Conservationists, are here today and gone tomorrow, and that the County of Currituck will always be there. They continue that local governments can do a better job of maintaining and restoring lighthouses. Where was Currituck County more than two decades ago, when the Currituck Beach Lighthouse was run down, and the Outer Banks Conservationists raised private donations to refurbish it? Where will the County be when they face a deficit in funding, and choices must be made between providing money for roads, schools, public safety, etc., or for maintenance of the lighthouse? While it may be true that the Outer Banks Conservationists do not reside in Currituck County (according to Rep. Bill Owens), that hasnt stopped them from raising more than $1.5 million for the restoration, maintenance and operation of the Currituck Beach Lighthouse over the past two decades. Under the NHLPA, the new owners must agree to adhere to the Secretary of the Interior Standards for Rehabilitation and make the site available to the public. Congressman Jones amendment does not include such language. In todays age, with rising taxes, and groups of every sort requesting public dollars for their cause, is it sensible for the County of Currituck to undertake such a task as would be required to maintain and operate the Currituck Beach Lighthouse? Or would it be more prudent to give permanent ownership of the Currituck Beach Lighthouse to the Outer Banks Conservationists, a group of dedicated individuals that, based on their record of restoration, maintenance and operation of the Currituck Beach Lighthouse, have proven their financial ability to maintain the historic light station. At the very least, the Outer Banks Conservationists deserve the opportunity to have their application to obtain the Currituck Beach Lighthouse reviewed by the federal panel as outlined in the NHLPA. For Congressman Jones to allow it to just be given to the county government under a quitclaim deed would undermine and destroy the National Historic Lighthouse Preservation Act. Again, an Act that Congressman Jones co-sponsored. I support the transfer of ownership of the Currituck Beach Lighthouse from the federal government to those who currently oversee its success  the Outer Banks Conservationists.